What is the difference between Paleo and Primal Diet? • Categorized under Diet & Fitness,Health | What is the difference between Paleo and Primal Diet? With the advent of agricultural revolution many years back, there has been an increase in various ailments such as diabetes, blood pressure, heart problems, obesity and other lifestyle related complaints. This goes to show that the changes in food habits have led to an increase in lifestyle disorders as the food consumed is more difficult to be digested and assimilated by the body. As a result diet and exercise have become an integral part of our life. The Paleo diet, also known as Caveman Diet or Stone Age diet, is a diet based on the food and eating habits practised almost 10,000 years ago by our ancestors, the cave men, and is totally different from the present diet which we follow. It is considered a healthy way of eating nutritious food which is in accordance to our body metabolism and genetic makeup, and help us to stay lean and fit. It forbids dairy products, legumes, grains, alcohol and processed foods, basically, all foods that were not available back during the stone age .A low carbohydrate and rich protein diet showed that our ancestral diet was very suitable for low cholesterol, blood pressure and better immunity. What is the Primal Diet? Similarly, the Primal diet is based on the same evolutionary science as Paleo diet but it is a different eating plan with its own set of guidelines. It believes in moulding your genes in such a way to make your body lean and fit. With advanced science and technology, we overlook very simple rules of how to keep the body fit. This diet focuses on low carbohydrate and high protein intake too but with a minimum intake of certain dairy products and certain fats. Even though both diets are based on the same principles of evolutionary science, there is a very thin line of difference between both of them. Paleo diet focusses on avoidance of dairy products, while Primal allows occasional indulgence in raw fermented dairy products like yoghurt and kefir. 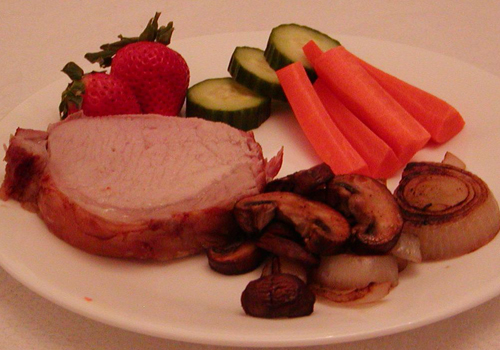 Paleo diet limits intake of saturated fats with an intake limited to lean meats. The founder and voice of Paleo diet Loren Cordain says a complete no for saturated fats as it is the main instigator for heart diseases rather than considering it an important source for certain neurological processes especially omega 3 fatty acids. Artificial sweeteners and diet soda are also not accepted in the Paleo diet, for as long as it is not sugar, it is fine. While in Primal diet occasional use of sweeteners is allowed provided the beverage or food will add some nutrition to your body. Lastly, the most important aspect of Primal diet is its holistic approach which not only focusses on food and diet but also on exercise, stress management, relaxation techniques to improve the physiological functioning of the body. Paleo diet focusses on carbohydrates and removal of toxins while Primal diet is more lenient on some amount of dairy products, certain starches and some amount of legumes. Primal diet is more of an adaptation of the Paleo diet that can be adjusted to suit the personal requirements of the individual. Paleo diet is more rigid than the Primal diet and more restrictive in its guidelines. The Paleo and Primal diets are different adaptations under the same umbrella. Both propagate eating like our ancestors did 10,000 years ago i.e. minus all the processed, packed, flavoured, sweetened, saturated food. Paleo is a more rigid and strict diet as compared to the Primal diet as it completely forbids dairy and meats. The Primal diet is more holistic in approach as it also stresses on other aspects of lifestyle other than eating. Primal diet can be modified to suit our personal needs and allows for the occasional dairy and sweetened products. rachita. "What is the difference between Paleo and Primal Diet?." DifferenceBetween.net. October 2, 2014 < http://www.differencebetween.net/science/health/what-is-the-difference-between-paleo-and-primal-diet/ >.